Google released Android N Developer Preview 3 and they have removed the system-level dark mode. But apps can still automatically switch between day and night modes. Introduced as part of the Android Support Library 23.2 in February, developers can now easily add a night mode that switches based on the time of day and location. Twitter appears to be A/B testing a night mode in the alpha version of its app, they have recently switched to full Material Design UI and this update is on top of that. 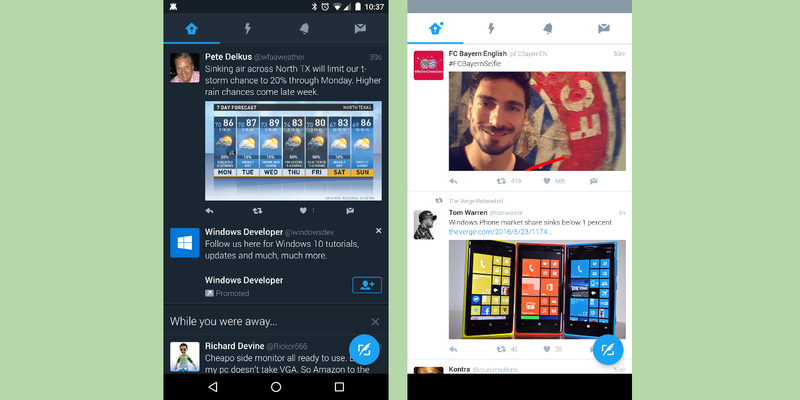 Twitter’s night mode swaps out white with a dark blue color. This particular user is on the latest Twitter alpha (5.112.0-alpha.423) and reported that the app automatically reverted back to a white day mode in the morning. Furthermore, there was no option in the app to manually switch off the night mode. Twitter is usually discreet with A/B testing, but it is highly likely that the app is using the new feature found in the Android Support Library. The company has yet to even officially announce the Material redesign of its Android app that quite a few users are now seeing. It might be a while before this Alpha features makes its way to the stable version of the Twitter. Hopefully, Twitter will add more controls over the mode before then. Users who want to sideload the latest alpha APK should note that even on this version A/B features are rolled out server side and sideloading won't enable this.